In my year and a half at BaRnArD cOlLeGe Of CoLuMbIa UnIvErSiTy, I’ve noticed people have many opinions about Schermerhorn Hall. It’s hard to navigate. It’s far away. It doesn’t exist. However, its greatest mystery is how you even say it. Well, the answer is: It’s Schermerhorn, with a hard “ch.” Skermerhorn, if you will. I know this because I used to cross Schermerhorn Street every day on my way to school, and have visited the Hoyt-Schermerhorn subway station many times. Also, it’s a Dutch name, and that’s how they decided to pronounce it. Look it up. So there you have it! 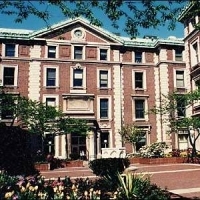 Schermerhorn Hall. Just hope you don’t have any classes in the extension. @alum Being ignorant of Columbia’s illustrious history is not remotely funny. Schermerhorn was a prominent New Yorker, Columbia graduate, and Chairmen of Columbia Board of trustees. He donated the money for the building. Many a Nobel Prize has been won from research in that building. @Anonymous Schermerhorn, a small town in North Holland as it was a cape into lake Schermer. John Schermerhorn ( 1786 – 1851) was Indian Commissioner during the presidency of Andrew Jackson. John Brighton Schermerhorn (1840 – 1910) was an early oil magnate.